The Broad-tailed Hummingbird, also called Selasphorus platycercus, has a broader and larger tail than other common species like Allen’s or Rufous. Overall, it has a longer body than other hummingbirds. Male Colors: Crown & back is a shiny, metallic green. Adult male will have a rose red throat (gorget). Under-parts are white. Flanks (side area) are green. Female Colors: Green back & crown. White throat, with speckles of bronze or green. Females look similar to Allen’s or Rufous Hummingbirds. Tail: Male has broad tail with rufous at base. Female has rust-colored outer feathers at base, white on the outer tips & black middle feathers. She also has green central tail feathers. Size: Small, about 4 inches long. About 0.13 oz. Bill: Straight, long & black. They eat nectar from flowers, sugar water from human placed feeders, and protein from spiders and insects. When not feeding on colder nights, the Broad-tailed Hummingbird will go into a slowed down metabolic state called torpor. Once the temperature goes below 44 degrees Fahrenheit they’re able to maintain 54 degree body temperature. Like other hummer species, they’ll aggressively protect their food sources by diving from high perch points toward their intruders. 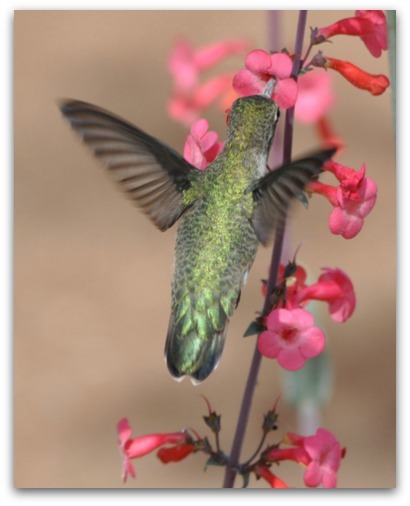 If you have a hummingbird garden, it’s a good idea to place several feeders far apart so you can attract varying groups. You’ll find them throughout the summer months in the southern and central Rocky Mountain area of the US, as well as eastern CA and western TX. They come to Arizona in late March and by May they’ve reached other Midwest states. They can also be found in Montana (in the more southern regions). Some of these states have valleys where it becomes colder at night. The upper sections of these valleys are warmer and are called upslope areas. Often, male Broad-tails will go upslope at night instead of entering torpor. Late September/early October marks the time to head back south again. Their US habitat is mainly scrub areas, thickets, canyon vegetation, brushy hillsides, mixed forest areas, and open woodlands. As I’ve mentioned above, they can survive in the colder areas other hummingbirds avoid. I do want to mention that Broad-tails have been spotted in other areas of the US, such as Louisiana, Alabama and even New Jersey. Male Broad-tailed Hummingbirds will engage in dazzling mating diving exercises of anywhere between 30 to 50 feet as they work to dazzle females. This diving action creates a loud buzzing as they descend. Once they mate, the males court other females and the new mother begins building her nest. These amazing birds will actually come back to the exact spot they’ve built nests previously and rebuild new ones over the old one. Nests are usually less than 1 inch in diameter and placed on a tree limb anywhere from 3 to 30 feet high. The female Broad-tail will use shredded bark, leaves and lichen to make her nest and she will line it with spiderwebs and the undersides of leaves. Babies hatch from eggs about half an inch in size within 14-17 days. They stay with mom for about 3 to 3 ½ weeks. She feeds them one to three times each hour and does it by inserting insects and nectar down their throats with her bill. Finally, the babies fly from the nest for the first time on a flight that can take them as far as 50 feet. They will cross breed, or "hybridize", with other species of hummingbirds. During the winter, you’ll find them as far as Guatemala while they’ll be as far north as Montana during the summertime. Every second, their wings beat about 50 times. Using his wings, the male Broad-tailed Hummingbird makes a trilling sound…quite unique.